On August 9, a lifebuoy reached Ara Beach on Ie-jima Island from Miyagi, which was affected by the Great East Japan Earthquake and tsunami. 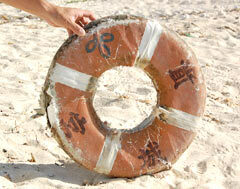 On August 8, a lifebuoy drifted from Miyagi Prefecture was found on the sandy beach in Ara, Ie-jima Island. Forty pupils from Fukushima and Miyagi elementary and junior high schools were surprised to see it. They visited the island on the Tidakids Project, which invites children to Ie-jima from areas affected by the Great East Japan Earthquake and tsunami. They were trying drive-fishing that day. The Ie Fisheries Cooperative Association found the lifebuoy when cleaning up the beach before the drive-fishing. The letters and logo of Miyagi Prefecture were printed on the lifebuoy and its torn cover was proof that it had been drifting for a long time. (c) The Ryukyu Shimpo Unauthorized reproduction of the photographs, articles and other materials is prohibited. Copyright is owned by the Ryukyu Shimpo Co. Ltd., or information providers.